Following are comments that we have received from customers and visitors of this web site and of our shop on Etsy. Click here to provide your comments. A beautiful box! Very pleased with it and it will make a great gift. Thank you very much! The recipients said the serving tray was extremely well wrapped & is quite beautiful! A well-crafted piece. I was disappointed that delivery was on the day after promised (when the recipients had gone away) & the package was left in the snow on the front step. A neighbor retrieved it & all is well. Holiday season taken into consideration, but the shipping cost was not inexpensive & I was counting on timely delivery. I wanted to let you know that I have received the Walnut box I ordered, and I love it! This is a Christmas gift for my grandson and I am sure he will also love it. For some reason this item is not showing on my purchased list, so I am unable to leave the very positive feedback I to. Thank you so much for your quick response to my order and all the shipping updates! I look forward to ordering my granddaughter's box for you in the future. It is definitely made well--I was just a bit disappointed that it wasn't somewhat heavier in weight. I think the price of 100$ may have been a bit steep. I am sure the couple receiving it will like it. I do love the 3 tone color--it's unique. Wow! Such remarkable craftsmanship. It's also highly functional, with lots of trays and compartments - each one is a beautiful work itself. Thanks! Beautifully made. Fast shipping. Very pleased with purchase. Quality of the product is very nice. The reason for 4 star (of 5) is the final coat on the wood had some marks on top of the box (circles of less than 1cm like bubbles). Other than that everything works good. Just a little minor thing is that the fit for the top of the box has some gaps, I believe due to the hinge mechanism. But if it can fit perfectly, it would be an awesome box, since the quality of the wood and inner lining is excellent. The box is the cutest thing. Thank you so much for making amazing products and for your hard work. It was very easy to make my purchase and everything is perfect. My partner is going to love it! Beautiful wood inlay and hinges. Feels well-made. Thank you! Beautiful box, I bought it for cufflinks and they fit perfectly inside. Jim gave a very quick and detailed answer to the question I had before purchasing, and shipping was extremely fast as well. A lovely couple and a joy to chat with. Beautiful craftsmanship and design, fast shipping, and great proactive customer service. I am so pleased with this purchase. Highly recommended! Thank you! It arrived today and looks beautiful. Absolutely love it. The box came today and it's absolutely gorgeous! Thanks so much!! The box is as beautiful as expected and the sellers were awesome to deal with. Thank you for the top notch customer service and quality product! This box is impeccably crafted and even more beautiful in person. The wood has a lovely depth and sheen (and I love the grain of the curly maple). It's perfect for keeping all your essential oils easily at hand. It's nice that the internal dividers only go up part way, which makes it easier to see the bottles' labels. The box was shipped quickly and packed very well to prevent any damage in transit. The Box arrived just fine, and the packaging was truly exceptional! We could not be more pleased! Suffice to say, we’ve added your website to our favorites for more purchases. The jewelry box I purchased was beautiful and very well built! The service I experienced from Jim and Kathy was also excellent. I highly recommend! Beautiful craftmanship and woodwork. I bought this as a gift and my wife loves it. I bought this for an engagement ring that I got for my girlfriend. (She said yes, btw). The craftsmanship is amazing! Beautifully made. I bought it at night and received an email with the tracking number from Kathy and Jim Sawada the very next day. I've looked at all their products and I highly recommend them, especially due to the fast shipping! More beautiful in person. Shipped quickly too. Very happy. Recommend highly!!! 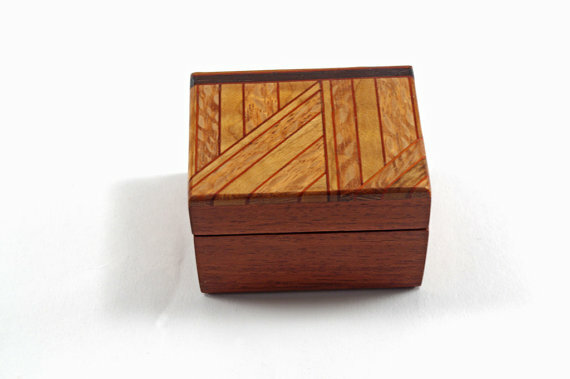 The box is very beautiful, made with wonderfully figured hardwoods and added a very nice touch to a locally designed and made engagement ring. She said yes, so thanks! She was very impressed with it. Shipped quick and Kathy and Jim were great to deal with. The item was just as it appeared in the picture and was very carefully packed for shipment. I would purchase again from this seller because of the high quality work. Beautiful piece and a perfect gift for my entertaining mother in law. Thank you! I am IN LOVE with this box! I can't wait for my wedding day! I bought a keepsake box as a gift for my wife. Jim and Kathy were very flexible, meeting me at their home with only a days notice. When I arrived they were extremely friendly and answered all my questions. The box itself is clearly well-made and exceeded my expectations. They are highly skilled at what they do... you can't get this kind of thing in a store! They even gave me an extra piece of wood so I could test out some laser engraving before doing it on the box itself. A+ experience and product, very highly recommended! I will need to take my rings off for work and this box is a gorgeous and sturdy way to store and keep them safe. It will fit both nicely and has a surprisingly strong magnet! It was packaged securely and shipped in a timely manner. My Tak set is absolutely gorgeous. The board turned out better than I had imagined, and the pieces are great. The zebrawood pieces came out a little rough on the edges, but I understand that's a byproduct of the wood itself, as opposed to any problems with the craftsmanship. Thank you for making such a precious item! It's an absolute joy to play and to look at. Beautiful box. Fast shipping and exactly as described. I purchased this box as a gift for my husband as a place to store his few rings and necklaces instead of the bathroom drawer. His late grandfather was a very skilled woodworker so I knew he's appreciate the level of craftsmanship that seemed obvious to me just from the web site photos. The box came very carefully packaged with recycled egg cartons cushioning it on all sides and wrapped carefully in brown paper. I didn't even unwrap the paper until I gave it to my husband on Christmas morning, and we were both blown away by the fine craftsmanship and the beauty of the natural wood colors. It is also the perfect size to store his minimal amount of jewelry and we love that it is an heirloom quality piece. Very happy with my purchase! Thanks so much for the prompt delivery of the serving platter. Your wrapping is so beautiful that I haven't wanted to open it yet. It is a gift for Christmas and I may just keep it wrapped up nicely with your wrapping until then! I'm sure he will love it though and I'm excited to gift it. I bought this jewelry box for my husband as a Christmas gift and I absolutely love it! The quality and detail that Jim put into this piece is just flawless. Highly recommend!! Absolutely amazing. SO well made!!! Even the wrapping and shipping shows that the maker is proud of their work. I can't wait to give this to my husband for Christmas! The box exceeded our expectations, a small piece of art on its own! Perfect for The Ring! Parcel arrived safely and intact. Thank you. What beautiful craftsmanship! Should the occasion arise, we would gladly refer anyone to your website and offer our recommendation as to quality and speed of transaction. Thanks, again and have a great day. Wow. I got exactly what I wanted and it was perfect! Their communication and customer service was excellent! I would absolutely recommend this shop to anyone!! This was one of the most beautiful valet boxes I have ever seen! I bought this for my husband and he was very, very pleased with it. The service was quick and very nice. Hopefully I will find something else I need from them in the future. Thank you for making such a fine product! This is a beautiful piece! Kathy and Jim even customized the item to fit our rings! Would highly recommend them! A truly wonderful piece! Also very quick to respond and really willing to work with my requests of shipping. Awesome work. Awesome people. Definitely recommend! Well made. Flexible with shipping options to handle a unique situation that got me the item on time! Just wanted to send you a quick note to let you know how much my wife is enjoying the jewelry box. I am sure she will treasure it for years to come. It was such a pleasure meeting you and seeing your work. Looks great, holds a ring well, and it's sturdy. This is a gorgeous ring box, far more beautiful in person! Kathy and Jim were excellent with communication. Shipping was entirely on point. My only disappointment is with the asymmetry of the hinges, one of which protrudes a bit higher than the other. That said, it is a nice reminder that this piece is hand-crafted! All in all, I highly recommend these craftspeople! The ring box is AWESOME. Thanks so much guys!! Beyond amazing!!! Incredible workmanship. Will absolutely buy from again. Thank you!! It arrived safely, and it looks very nice -- better than on the website's photograph! I'm giving it to my wife for Christmas, and I'm sure she'll love it. Thank you so much for making a beautiful box that my fianc�e loves! She brings it with her whenever we tell our friends and family about the great news. I have attached a picture we took in St. John on the day we got engaged! Great service, great craftmanship, great quality! Exactly what I wanted and what I ordered. Great seller! Received the (jewelry) box, thanks so much. It was beautiful and certainly met--if not exceeded--my expectations based on the customer feedback on Etsy. My wife was blown away! I'll make sure to add feedback in the coming days. Thanks again! The box was awesome, she loved the ring and the box. it showed up very fast and Kathy / Jim were great to work with. The only issue at all was, the lid of the box wasn't glued to the hinges so it can come off the box, if you don't open it properly. I am so pleased with my purchase! The box I ordered was more beautiful than I imagined, and Kathy and Jim were very helpful with my order. Many thanks! Beautifully made and arrrived very fast. Wood detail is amazing. I was looking for a true heirloom quality jewelry box to give my fiancee as her wedding day gift. My criteria was to find one that was unique, handmade, beautiful, of superior quality and made in Canada.........I was fortunate enough to find Kathy and Jim's website and I went to their home to see the jewelry boxes. 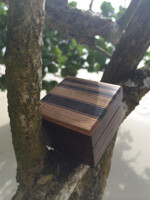 The work exceeded my expectations and I purchased a beautiful Olivewood jewelry box for my fiancee which I hope will be something she will have forever. The best part of the process was dealing with Kathy and Jim......they are truly welcoming and warm and were a pleasure to deal with. Thank you very much for a great experience and a wonderful jewelry box. Thanks Jim. (Ring) Box looks perfect. Incredible workmanship. Wonderful ring box! I bought it for my husbands wedding ring, and he couldn't be happier with it. It arrived quickly and beautifully packaged. My jewelry box arrived today safe and sound. It is absolutely beautiful. Your description of it as quietly elegant is spot on. I had a hard time deciding which box to choose and I am thrilled with my choice. Thanks for the great communication back and forth. Our daughter was delighted with the jewellery box. The quality is amazing. It was a pleasure to meet you in person and to discuss woodworking with you. Keep up the great work! Thank you for the amazing box!!! I gave it to my wife as a wedding present and she absolutely loved it!!! the jewellery box was extremely well received as expected. She loves it! A real treasure that my wife already says will be one day passed onto our daughter. Thank you for your attention to detail. special and one of a kind. I will cherish this piece of art always. Thanks Jim and Kathy. (....) loves it. It is full. She purged some of her semi precious jewellery and relegated it to her lingerie drawer. Who knows, I might be calling on you in a few years for a second one. Happy new year. My tray arrived safely and it is lovely. Thank you. The box arrived and it is beautiful. The pictures underestimate the beauty of this box. I shall cherish it forever and fill it with my many baubles. The craftsmanship here is uncommon in our current day and age. Thank you for putting an obviously high level of skill and talent into such a pretty piece. .... absolutely adores her anniversary gift. Thank you so much for your patience while I decided on exactly which box to get. It is perfect and your handiwork even impressed my father, the world's greatest perfectionist. Hi Jim, the box is beautiful, absolutely stunning. thank you!! Just received my jewelry box. It's excellent, worth every penny. The pictures don't capture the pure ART that this piece is! Hi Kathy: Dont tell my family but it was better than Christmas!! Got the boards last night - they are just beautiful - exactly as I had hoped. I've wanted something like this for soooo long. I will be using them on Sat nite!!!! Rest assured if possible I will be very quick to recommend you and Jim - great work and delightful service. My search for a superb craftsman finally ended when I located Jim Sawada. I was looking for two momento boxes that would contain correspondence and special objects which I plan to leave for my children on my passing. These had to be no ordinary boxes as you can imagine; rather pieces of art which would house my "soul". When I saw the finished pieces, I knew that I found the right person for the task. From design to completion, Jim and Kathy were gracious and helpful each step of the way. Their attention to detail and creative suggestions were an integral part of this labour of love, for which I am thankful. Arrived in perfect shape...its beautiful....thank you. Hi Kathy, Thanks for doing such a wonderful job on the toy boxes. They look fantastic! I'm a former customer who is very satisfied with the boxes I bought in the past. This year I'm interested in a woman's jewelry box. I would like to come over to your place sometime soon and select one before these beautiful boxes are all sold. I just received the box and I must say that you are a very impressive craftsman- I love the little details! Very nice hardware and the corners are just lovely. The quality of the trays and drawer are just as impressive as the wood grain on the outside. Bravo! Hi Kathy. Well, she was overwhelmed. She said, "Mom I never expected it to look like this, I absolutely love it". Her fianc� when he saw it said,"OH MY GOD". "That's amazing". They are thrilled, as am I. You are both wonderfully gifted and you make dreams come true. I am forever grateful. I want to stay in touch with you as I really enjoy being around you both. Perhaps after the wedding we can get together for a glass of wine. Hugs and many many thanks! Thank you for providing such good customer service! It's rare these days that people go above and beyond :) I'm happy that I chose to order through you and Jim. Not many places would check if items have arrived. Great job on the chest Kathy and Jim�thank you very much! (he) absolutely loved the CD box. It's brings a professionalism to him. We've received many compliments on it. I'd like to thank you once again for your wonderful work. Have a great day! I did get the box on Monday, just got around to opening up the package tonight. Everything looks good. Great work with the wood, grains and the detail of the keys is a nice balance in the design. I especially like the 'v' cut in the key on the ends... Just the right size for what I needed it for. .... Again, great job I will use this for years to come. Hi Jim. We received the beautiful box today!! I couldn't wait to give it to my husband till Xmas, so I let him enjoy it now. He absolutely loves it. As soon as he opened the package (which was packed perfectly safe) he moved all of his jewelry and pens and watches and such into his new toy. He is a craftsman himself and thought your work was just brilliant. Thank you for your help and your craft. Please let us know if you post anymore unique boxes on your site as we are collectors of unique items. Cheers to you and yours. Hi Jim, I received the wooden valet today; it's beautiful. I hope my husband likes it. My 17 yr. old son loves it; and thinks that my husband will like it also. Thanks so much; I'll let you know what happens. Happy holidays to you and your family. The box arrived today. It's beautiful -- exactly what I was looking for. I hope my new son-in-law appreciates the beauty and workmanship as much as I do.